Another home game, another postponement. Another set of disappointed away fans, another collection of internet vitriol. Crawley Town seem to have become the footballing equivalent of Michael Fish- unable to predict the weather correctly but still willing to have a go despite criticism. It seems that the view from afar is that Crawley Town are “tinpot.” (there were a collection of less pleasant words too). CEO Michael Dunford has said publicly that he’s embarrassed by the situation. It’s probably fair to say that the rest of us are similarly embarrassed. We also seem to have a number of our own supporters queuing up to kick the club. But the most important questions seem not to be asked- what are we going to do about it? And who is going to do it? The club have a number of difficulties. Firstly, the position of the ground makes it difficult to drain. It’s at the bottom of a hill. The A23 behind the East Stand only needs a short spell of heavy rain for water to begin pooling in large quantities. The drainage system under the pitch relies on a stream just outside the western boundary of the car park to take the water away. If that gets overly full, where does the water go? Secondly, we have had appalling weather. According to the Met Office, the Southeast has had “more than twice its average rainfall with 175.2 mm of rain from 1 – 28 January. This beats the previous record of 158.2 mm set in January 1988″. I can’t remember ever having such a period of rainfall, and, of course, I’m not only ancient, I’m a northerner. As such, I’m an expert on appalling weather- my formative years were spent sheltering from either rain or snow. Indeed, I remember as a Bishop Auckland fan in my youth travelling to Carlisle for an FA Cup match which was then called off at 70 minutes as the pitch was waterlogged, then again postponed for snow when we were en route, before finally being moved to Workington (which was so soggy I had to watch in wellies). But moving away from my reminiscences, the adjacent picture is from the Met Office. It shows January rainfall. Crawley is under a dark blue bit. You can work the rest out yourselves, but for our unhappy friends from the north, whilst we understand that there are things the club perhaps could have done better, it demonstrates why we have only limited control. They tried covers, industrial dryers, every member of club staff and a collection of supporters on the field with pitchforks, groundsmen who’ve hardly been home in weeks, more sand than the beach at Southport- and still, no football. Apart from selling the soul of Sergio Torres to the devil in exchange for sunshine, there’s very little else they could have done in the short term (and Sergio’s soul is, of course, so precious the devil would have struggled to afford it). CTFC can’t just arbitrarily make a decision to call a game off. Now the local weather conditions had been extreme, but had improved, so the League Secretary probably wouldn’t have been consulted (rule 2). But they then deteriorated once more late Tuesday afternoon, at which point it would be down to a referee (rule 3/4). The club can’t control referees, and referees have a great responsibility to make difficult decisions correctly. We may not always agree with them, but not many of us would want to be one. The fourth difficulty is, however, perhaps the most difficulty to resolve and the most important. It revolves around money. CTFC don’t have enough of it. We have owners funding the club because it isn’t self sufficient. This statement worries me. I’m grateful to the owners (and like them personally too) but wonder what would happen to the club if their circumstances were to change. Our owners may be wealthy individuals but they aren’t in the league of Roman Abramovitch or the ruling family of Abu Dhabi. 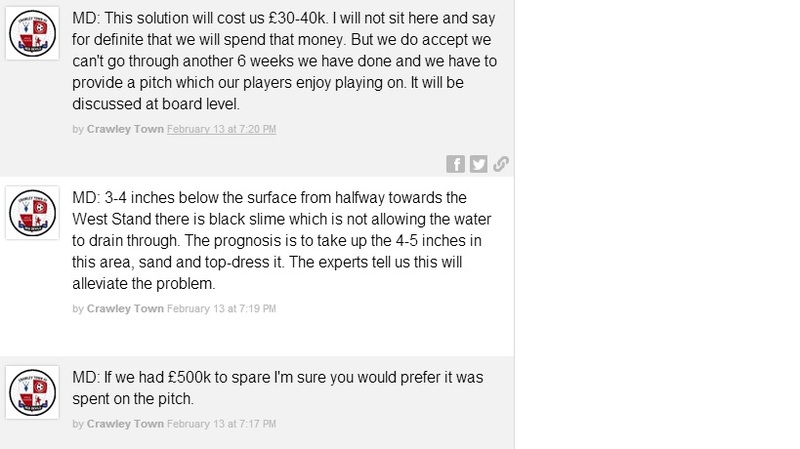 As Michael Dunford said at the recent fans forum, they’d rather invest in the playing squad than the pitch. See the picture below, taken from the Redz Wall transcript. That decision is perhaps questionable. Firstly, players like to play. Ours don’t get to do that. So will our best players be encouraged to join a club that doesn’t ask them to play beach football or water polo? And will we be able to persuade similar quality players to join us if we have a pitch that forces us to keep the ball off the ground? It’s no wonder we play better away. Additionally, can we afford to keep losing matchday revenue- there is no way in a million years that teams like Wolves, Carlisle and Stevenage will bring as many supporters to a Tuesday night fixture as they would have to the original weekend match, leaving us with lower attendances, less money spent in the bar, on refreshments, on programmes etc? Brighton, Crystal Palace and perhaps Millwall are our nearest league clubs and they haven’t had the difficulties we’ve experienced despite having the same rain. Why? More investment in the infrastructure. That isn’t a criticism of CTFC, it’s just a fact. Michael Dunford has, for me, made a collection of sensible but difficult financial decisions- perhaps far more than his predecessor ever managed. I think he’s a strong hand on the tiller. The problem is that the SS Crawley Town was shipping water when he arrived. Budgetary decisions- including a bodge job on a pitch that even 18 months ago needed replacing- seemed secondary to seeing how many former members of Aldershot staff we could fit into the office. These decisions can’t- despite some on the forum and on twitter trying to do so- all be blamed on Richard Low- he was an employee. Eyes upstairs were not fixed where they needed to be. They seem to be now. So, what are we going to do? It seems obvious to me that at this point we need to invest in the pitch. There has been no commitment to do so and there needs to be one. To quote the CEO, “I will not sit here and say for definite that we will spend that money.” Well Michael, you need to, if it can be found. Yes, this year’s weather has been exceptional, but we were here last year too. We can’t afford to be here next year. I know that it’s a financial balancing act, but at the moment we’re a laughing stock and we’re losing money. Some of that- the savage nature of the weather- is out of the clubs’ control. Some of it- the fact that the pitch has been a long term disaster zone and isn’t getting any better- needs the club to take ownership. Even if we had fifteen groundsmen rather than two, they could only work with what they’re given, and what they’re given is shocking. We also need to make sure that we’re not making promises we can’t keep- like assuring people games are going to be on when we’re in the middle of a period of freak weather which we obviously can’t control (unless we’re going to act on my idea about the soul of Sergio). Trenchfoot is what our groundsmen are likely to suffer from if this continues. Foot in Mouth should, however, be completely avoidable. Tell Tubbsy to keep his kit on, and remember that flappy birds might not be funny when you’ve travelled four hundred miles for a football match called off just before you get there. That said, the “who is going to do it” question brings us back to money again. If the “What are we going to do” question is answered with fixing the pitch, somebody needs to pay for it. The fact that the club is being funded by the owners demonstrates quite clearly that it doesn’t have enough money coming in. Where’s the funding going to come from? A new ground has been mooted, but even if that turns out to be more than a pipedream, it isn’t going to happen any time soon. So what’s going to change? If we’re lucky, we’ll be good enough for another season in League One next year, but that hasn’t inspired an enormous rise in attendances either this year or last, so that’s unlikely to change. Yet only a rise in attendances is likely to bring the increased income required in the short term- there’s little else to sell commercially and not much more that can be cut to save money. So how do we make that happen? Unfortunately we can’t play Manchester United every week. I went on to suggest that if the supporters of CTFC had a financial stake in the club it would perhaps galvanise them to work harder for its success. Now this blog got the largest response of anything I’ve written. Emails, tweets, Facebook comments and a thread on the forum. 3000+ visits to this website. But that doesn’t tell the whole story. I got more response from AFC Wimbledon supporters than from our own. The response I did get from our own wasn’t even lukewarm- two emails of support, half a dozen telling me I should mind my own business, and a collection of assorted vitriol via social media. The club weren’t supportive of the idea either, although at least they were polite! It seemed very much that apathy rules ok.
We can’t expect the club to keep finding money it doesn’t have, that’s unsustainable. Patently the cash flow issues are now impacting on all aspects of the club- we haven’t had a home league match in 2014, the academy is closing, staff are being let go. There are no other league clubs in exactly that position. I look at the response from many of our own supporters to the latest postponements on social media, and I find it hard to dissuade myself from the view that we’ve got the CTFC we deserve. One that doesn’t have the finances to compete without handouts that we can’t, with the best will in the world, rely on forever. The CTSA works hard to support the club, and we’re all volunteers. But we’re not strong enough, currently, to make the contribution we’d like to make, and even if every member put in time and effort, a few hundred won’t make an enormous difference. But a few thousand might. We have a few thousand regular home supporters. But we also seem to collectively have the view that moaning about the club is our job but helping it is somebody else’s problem. We’re very free with advice, but very short on involvement. I struggle with that concept. I think the best clubs are likely to be those with the strongest supporter investment and involvement. So, to end, what do we do about it? What would you do about it? For me, we need more supporter involvement -and investment- at all levels, including on the board, as only that would go towards fully integrating CTFC into the local community by, indeed, making it our football club. But the CTSA would like to have your views. Please, however, could you make them constructive and perhaps not from an AFC Wimbledon perspective this time!